The Arakura Ushuaia is the green building set up in the mountains on the far left. 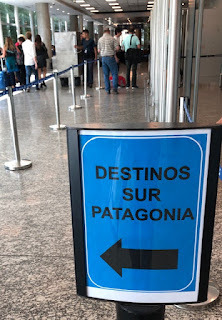 When I learned the flight from Buenos Aires to Ushuaia is three and a half hours long, I was taken aback. That's the distance from Chicago to Los Angeles. Americans, what is to be done with us? We assume everywhere that isn't the United States must be small. But 2,600 miles is quite the distance within a country not my own, due south yet, from the Paris of South America to a town that calls itself 'The End of the World." 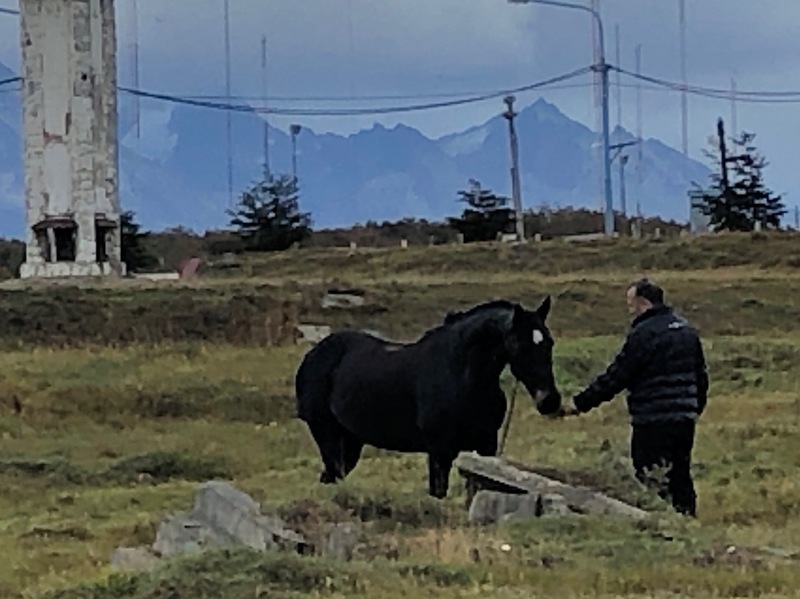 Ushuaia, despite being the southernmost city on earth was, almost needless to say, bigger than I expected. A city not unlike Boulder, Colorado, set in the foothills of a mountain range, though the southern slope of the Martial Mountains—an offshoot of the continent spanning Andes—struck me as several derivations larger than the Rockies. "Ushuaia makes Boulder seem like Kansas," I said. This is where Ernest Shackleton and his crew set sail for the Antarctic, and to this day polar expeditions gather to push toward South Georgia, a thriving industry still, judging from the signs for polar adventures and stores offering snowboards and fleece. The organizers of our expedition to the glaciers of Chile, the Royal Canadian Geographical Society, had put its adventurers up in the Arakura Ushuaia, an improbable luxury hotel tucked high in the mountains, framed by a snow-capped peak. The place is huge, with the vibe of a hotel in Finland, all bleached wood and raw stone and odd energy-saving touches—you tuck your room key in a slot to turn the room lights on, and they flick off when you leave, thus saving the planet. There was also a series of expansive outdoor thermal pools, where I set up operations, as well as a lap pool, where I happily swam off the confinement of travel. The hotel prides itself in its classical music series, and we excused ourselves from dinner early and went over to listen to the Camarata Bariloche, a well-known Argentinian string ensemble--a dozen violinists, a few cellists and a bass. It felt so disorienting, to travel all this way only to sit listening to Bach, like traveling to Mars and finding your childhood home. The next day we wandered the town—mostly closed on a Sunday morning, but a caretaker was already at the Municipal Cemetery, ready for visitors, and we strolled around. It was quite run down, with markers toppled and crumbling, and humble to begin with, a modest contrast to the luxurious granite tombs and marble angels at Recoleta Cemetery. Though, it hardly needs to be pointed out that the occupants here are just as dead, at a fraction of the cost. Caskets could spied through glass doors, and tableaus of the lives of the departed are set out—photographs and coffee mugs and poignant notes from children crying out to their parents. Some caskets are covered with lace, given covers like beds, which I suppose they are. We spent a long time there, walking up and down the aisles, gazing in near silence at these tributes to lives that had unfolded in this out-of-the-way place. Memento mori. There was some kind of charity race going on, with young people in running clothes with numbers pinned to their shirts. The military had set up a tent to show off their various specialities, diving equipment and machine guns and such, a friendly public service that only subtly conveyed: We aren't drowning your kids in the River de la Plata anymore. Michael and I wandered over to an old airfield, where a mothballed DC3 sat slowly moldering in the high winds ruffling across the Beagle Channel. Chile sat there, in plain sight, across the water, as if telling us: get on with it already. You don't often see an old bird like the DC3, and I slowly walked around the plane, inspecting it from all angles. When I looked up, Michael was gone, vanished over a fence and into a nearby field, where he had found transportation of an even more ancient lineage. I considered following him, but paused at the fence and held back, letting the two have their moment of communion uninterrupted. Fitting to find a DC-3 at the end of civilization. For a time in the 90's Vintage Airways flew them between Orlando and Key West. I regret not jumping at the opportunity to fly the iconic aircraft. My first long flight was aboard its' descendant, the DC-4, from Glenview NAS to Fallon, Nevada. Like its Papa it was unpressurized and slow, noisy and cold. Uncomfortable the most fitting adjective for the 11 hour trip, sitting on large steel tool boxes because the web and pipe seats(Think beach chairs, only heavier)were even worse. I realized that these uncomfortable seats were a strong inducement for first time parachutists to overcome their fears, jumping being preferable to the pain. Still, I was excited when the engines roared to life before take-off. Then the pilot asked us all to crowd toward the front as we taxied, I was first into the cockpit, a front row seat. I asked if we had to stand during take-off. He explained that because of the landing gears' configuration, a removable tail strut kept the plane level while loading. As we taxied he wanted as much weight forward as possible, just in case a quick move could upset the delicate balance, causing the aircraft to fall on its' tail. When we lined up on the runway and revved the engines for take-off the propellers biting into the air would keep us on keel and we could return to our seats. We successfully lumbered into the air near the end of the same runway that was the journeys end for wounded Vietnam vets aboard MACV flights bringing them to Chicago VA facilities. Sounds just like the plane we took from San Diego to Danang in 1964 or 5. Took 4 days, including an 8-hour sleep over in Hawaii. Played cards and smoked...a lot, quite a lot. Stopped in Guam and Midway, from one of which we had to take off almost straight up to avoid the goony birds. We returned to the states 6 months later (rotating crews on amphibious craft) on a 727, a much more comfortable ride or sure. Some 50 years later, my daughter's boyfriend took her to Danang and proposed to her there. Who knew the place was romantic. I made the flight from Clark AFB in the Philippines to Travis AFB in California. About 20 hours, trusting my memory, but in a stretch DC-8, World Airways on a military charter. They crammed as many seats as possible, must have been paid by the head, not a problem for the tiny Asians aboard but a nightmare for us full sized Americans. Refueled in Guam and Hawaii, otherwise I was jammed against the window uncomfortably the entire trip, and doubly pleased to be back in the USA. I cannot imagine making that trip in a Navy C-54. I doubt the key slot offsets the carbon footprint laid down by air travel. Tourists should be forbidden to comment on global warming climate change. 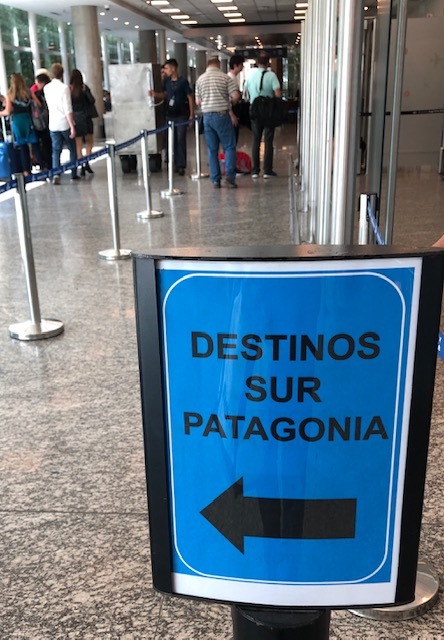 Should Neil be sufficiently polylinguist, he might have some conversations in Welsh (Cymraeg) traveling in southern Argentina. A Welsh colony was established there in 1865, and there are said to be some 50,000 of their dependents still around.They could maybe get together for a nice hymn sing. Nice to learn about an unvisited part of the world. And interesting to find that unvisited doesn't mean uncivilized.